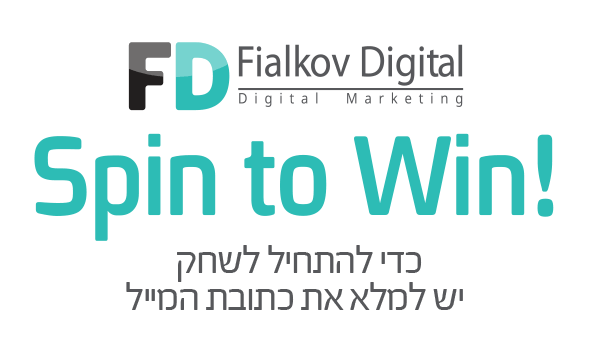 Fialkov Digital is an Israeli based social advertising agency, focuses on delivering performance-based results for clients worldwide. The Israeli Building Center is a group of companies supplying various services to the private and professional market, including a visitor's center, the Building College and the Ultima School of Design, as well as consultation, and housing and real estate fairs. 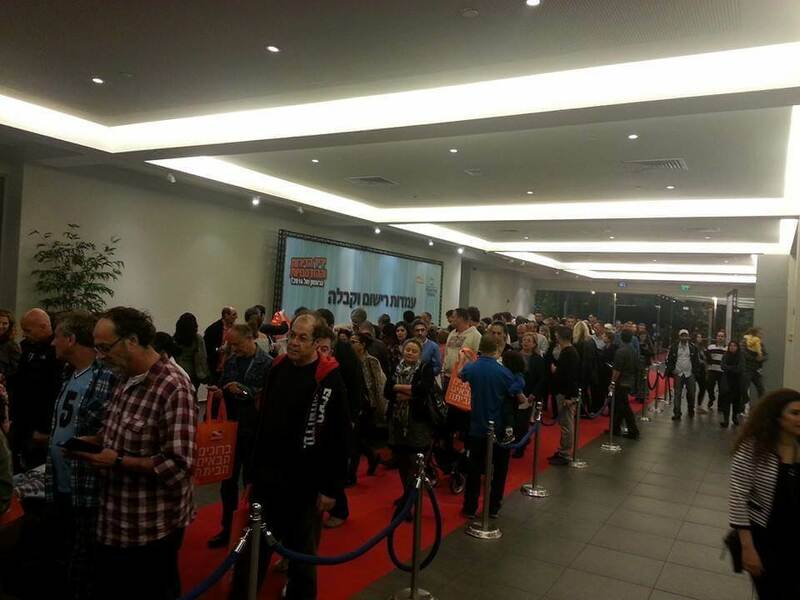 The end goal of the campaign was to register possible buyers to the Housing Fair at Tel Aviv's Israel Trade Fairs Center. we based its campaign on three main segments: those interested in purchasing apartments, people who are similar to those interested in purchasing apartments and Israeli Building Center fans. 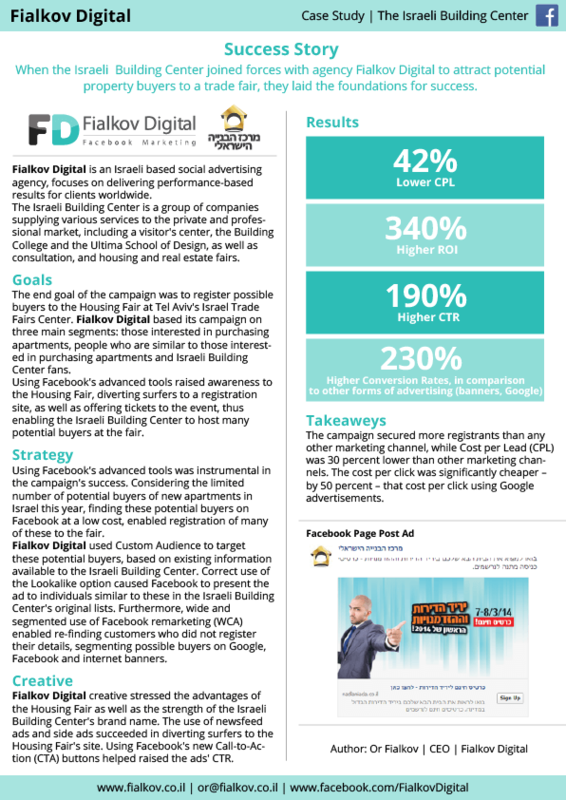 Using Facebook's advanced tools raised awareness to the Housing Fair, diverting surfers to a registration site, as well as offering tickets to the event, thus enabling the Israeli Building Center to host many potential buyers at the fair. Using Facebook's advanced tools was instrumental in the campaign's success. 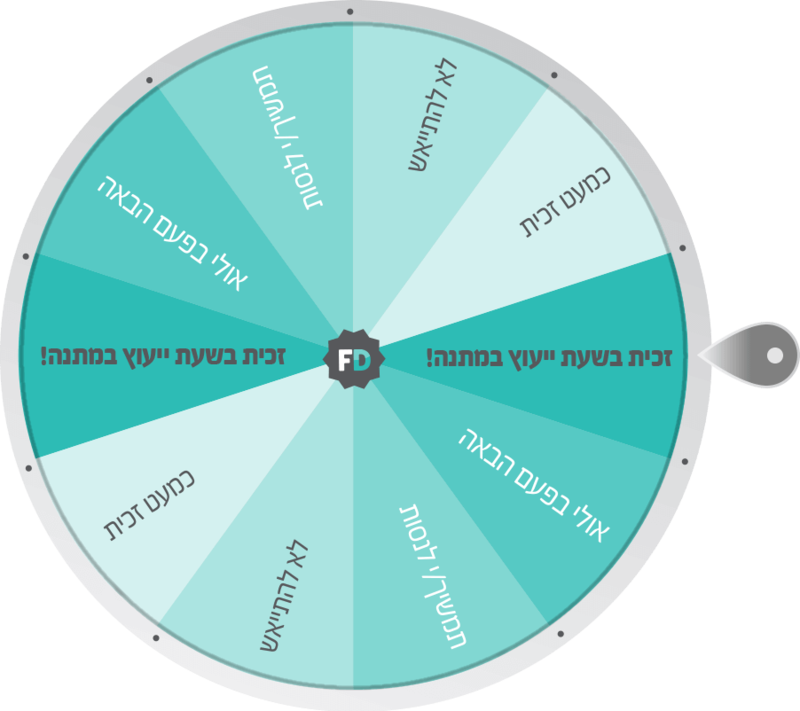 Considering the limited number of potential buyers of new apartments in Israel this year, finding these potential buyers on Facebook at a low cost, enabled registration of many of these to the fair. We used Custom Audience to target these potential buyers, based on existing information available to the Israeli Building Center. 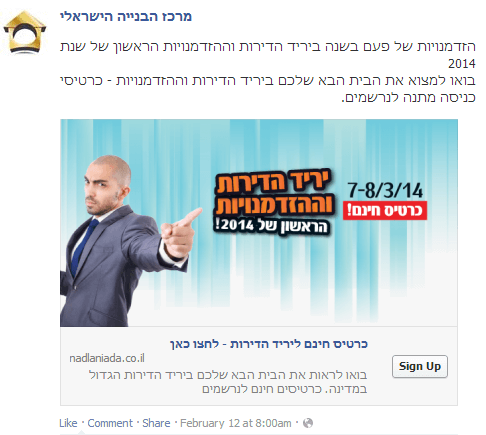 Correct use of the Look-a-like option caused Facebook to present the ad to individuals similar to these in the Israeli Building Center's original lists. Furthermore, wide and segmented use of Facebook remarketing (WCA) enabled re-finding customers who did not register their details, segmenting possible buyers on Google, Facebook and internet banners. We creative stressed the advantages of the Housing Fair as well as the strength of the Israeli Building Center's brand name. The use of newsfeed ads and side ads succeeded in diverting surfers to theHousingFair's site. Using Facebook's new Call-to-Action (CTA) buttons helped raised the ads' CTR. Together with Facebook's advanced tools,We offered low expense leaders and returns beyond expectations. "One of the Israeli Building Centers' main focus is on reaching potential clients across the country. Leveraging social platform has yielded the best response from our target clients." "Using Facebook’s advanced tools was critical to the campaign’s success. Considering the limited number of new apartment buyers in Israel this year, finding potential buyers on Facebook at low cost and being able to engage online or at the housing fair was really important."